St Moninne Churches at Killeavy site of the annual pattern to the holy well. This is a seasonal summer song of calendar customs unique to the Oriel tradition. It has connections with the older seasonal festival of Bealtaine (May) which was held to celebrate the beginning of the summer half of the Celtic year. It was also entitled Lá Fhéile Blinne (St Moninne’s Feastday) and Ag a’ Phatrúin (At the Pattern) showing a connection between this song and the religious celebrations of the pattern of Blinne at Killeavy monastery on July 6. This connection and overlapping of traditions was likely to have occurred when the Bealtaine and Lúnasa traditions were incorporated into the Christian celebrations of Feastdays and Patrons, possibly during the Middle Ages. It was collected in 1908 by Enrí Ó Muiríosa (AHU pp. 363-65) from Mrs Susan/Sarah Humphries (AHU pp.394-7) from Doctor’ Quarters Lislea. Co Armagh. The traditions and calendar customs associated with Bealtaine survived well into the early part of the twentieth century in Monaghan, south Armagh and in Louth as part of the local pattern, at Maytime and midsummer: ‘the Omeath patron was famous in old days and people came from all parts of Killeavy, Cooley and Lordship (and Faughart). The girls of the different townlands vied with each other in making dolls for this social occasion and the competition also led to faction fights.’ The dolls were called Babóg a’ Phátrúin, Craobha or Géaga (Pattern Dolly, Garland or Branch). One source from Farney in Monaghan recalled that the song Babóg na Bealtaine (the May Doll) used to be sung by the youths and maidens on May Eve while they carried around the ‘May Baby’ from house to house. This song, Amhráin na Craoibhe, was, according to Sarah Humphreys, sung by the gathered crowd as they walked about carrying the craobh. Sarah explained that the craobh was a fancifully dressed artificial doll, effigy or garland. According to Sarah Humphreys, the song was sung at the Killeavy pattern celebrations. Pattern is from the word ‘patron’ and was an annual commemoration on which parish churches were dedicated to the respective local saints. St Blinne, or Moninne, is the local patron saint in Killeavy where she once had a convent. The pattern, celebrated on her feastday, 6 July, was traditionally a day of entertainment, dancing, singing, matchmaking, rivalry and competition. Though the pattern was held for religious purposes, it incorporated the traditions of the older seasonal rituals with the lighting of bonﬁres and the carrying of the doll at the heart of the celebrations. The doll dressed in ribbons and other materials would be erected high on a pole or stick and carried around by groups of young women. These celebrations featured elements of song, drama and dance. According to the Dromintee folklore collector Michael J. Murphy (AHU 383-4), dancing took place locally on the mountain slopes, ‘on Johnston’s mountain at a level spot near the tower or at the ‘Two Big Rocks’ (on top of Carrickbroad Mountain). They danced on Slieve Gullion too, since they show a circular plate of green grass amid the heather trodden flat by feet many years ago.’ Beyond Mullaghban, in the hills, at the foot of Cashel Plantin’ is Cnoc a’ Damhsa (The Dancing Hill), which was also traditionally used for dancing. It is more than likely that this song was also connected to the dance. There is no direct evidence, however, that it was danced whilst being sung. But we do know that it was sung collectively during movement. Sarah Humphreys’ account tells that the song was sung by a group of young people while they were walking: ‘Dubhairt sí gurb é an ceol a chanfadh an sluagh, is iad ag siubhal thart leis an Chraobh Lá Fhéil Blinne’ (She said that it was the song which the group sang while walking around with the Garland/Doll on St Blinne’s Day. This song points to the survival locally of a very old tradition within living memory, linked to the most primitive type of carole and to ancient traditions of Maytime. The words and music were reconnected by traditional singer Pádraigín Ní Uallacháin and recorded by her on Gael Linn CD An Dealg Óir, arranged by producer Steve Cooney. She sings it in the above opening video, with accompaniment on the early wire strung harp played by County Armagh harpist, Sylvia Crawford, recorded at the performances of Oriel Music at Éigse Oirialla in Omeath 2016. 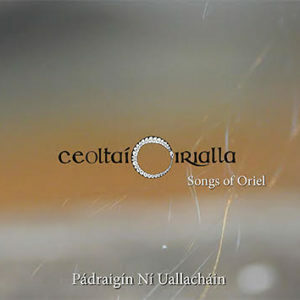 It is recorded on Ceoltaí Oirialla – Songs of Oriel Cd 2017. Ag an Phátrún: Amhráin Chúige Uladh 1927, 30 sung to the same air as Cuacha Lan de Bhuidhe. haigh dó a bheir í ’bhaile ’s haigh dí. Is de réir ’s mar chluinimse bhain muinn ariamh é.
hey to him who takes her home, hey to her. And as far as I hear we have always won it. This category of song probably had its origins in the medieval French carole which found its way into the song tradition from the coming of the Normans in the twelfth century to the middle of the ﬁfteenth century. The carole was a light love song with refrain to be danced to in the form of a round, with one person leading the song and the rest collectively singing the refrain and dancing in a line or a circle at the same time. The airs belonging to the carole category of song, which would have evolved primarily for collective singing and dance, are usually very simple and repetitive melodies. Musicologists and practitioners, who usually regard these melodies as being of lesser value than the airs composed for songs in the more sophisticated amhrán metre from the seventeenth century onward, have frequently misunderstood them. Seán Ó Tuama, in a study of Irish language song, An Grá in Amhrán na nDaoine, observed that the metrical forms employed by the carole in France were usually A+C (one line with refrain) or 2A+C (two rhyming lines with refrain) or 3A+B+C (three rhyming lines with cauda and refrain) and that the ﬁrst two forms were linked with the most primitive type of carole which has been traced back to women’s ancient dances at Maytime. He also notes that many of the examples of the A+C form, extant today, are also songs linked with the coming of summer. In Amhrán na Craoibhe we have the metrical form of A+C and its refrain beginning with heigh. The hye in French or hey in English were vocables marking a stamping action in the refrain of the carole.